> BMW i8 vs BMW M4. Can gasoline power still hold its advantage? BMW i8 vs BMW M4. Can gasoline power still hold its advantage? Are hybrids ready to take over the world of performance cars? 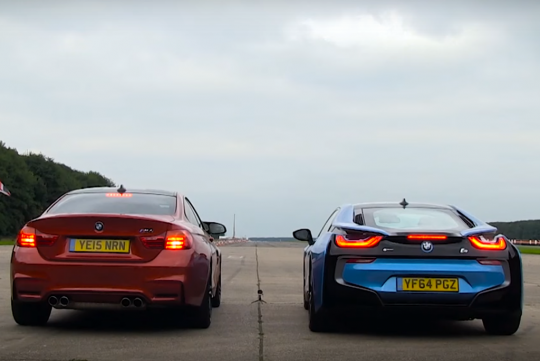 Top Gear pairs the BMW i8 hybrid sports car with the BMW M4 for a quarter mile drag race to give us the answer. With a total of 357bhp combined, the all-wheel drive i8 is 68bhp down on power and nearly 40kg heavier than the rear-wheel drive M4, it doesn't look like the i8 will be able to fend for itself. But with all-wheel drive and instant torque from the electric motor, who knows? Watch and see who is faster!